"I remember the day my main man Keith Turner told me that he added text messaging to his phone. He fought it for a long time, but I understood his position. An added feature was an added expense and I was learning through his actions how to prioritize the things we want vs the things we need. Wasn't long before that first message came through but what took place next was the start of something unique, something different, something special. To be honest I don't remember who did it first but one of us responded to a text with a rhyme. Soon after we would text lyrics and poems throughout the day. One day, while talking with Keith, he said he wanted to fit all of his words in the "fixed" space provided in a text message, which meant using only the given characters in the standard text and not going over (160). Pretty soon we were hooked. Almost all of our correspondence was done through rhymes, and Keith, being so excited, quickly began to recruit new 160 Soldiers. 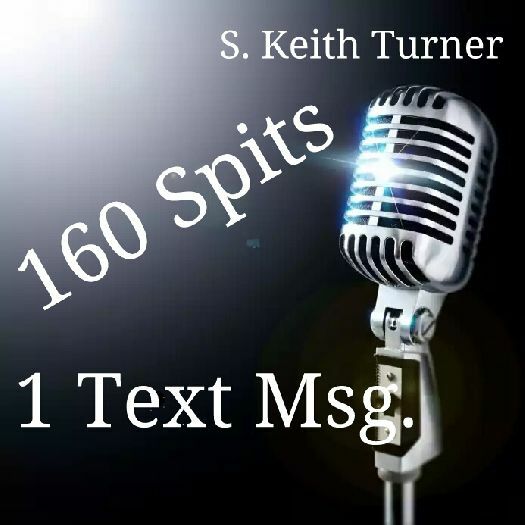 The time had come to come up with a name and we threw a few around but out of the blue came the name The 160 Spittas. (Epub File) can be read with any Ebook Reader that Reads Epub Files. -- "Moon Reader" is A Great Epub File Reader App on Android Devices. -- "iBooks" is A Great Epub File Reader App for Ipad/Iphone.